Congratulations on being a contest finalist!! Congratulations Brad on being runner up. Well deserved! 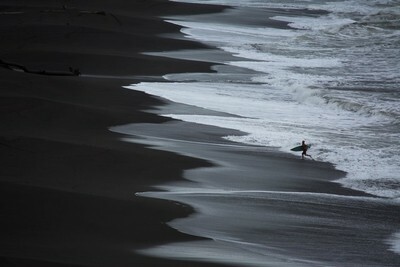 This photo was taken at Playa Hermosa, Costa Rica during an overcast day. I took this on a cliff in Costa Rica overlooking a black sand beach. The lighting was really interesting because it was overcast but the light bounced off the highlights (white foam) giving it that crazy contrast look. Nikon D7100 and a 300mm Xoom lens. I was on a surf trip and when the moment strikes you take advantage. Yes, but this was only bringing up the whites and dropping the blacks down. Nothing more. I usually carry my Nikon D750, the Nikkor 24-85 3.5, Sigma 100-500 zoom lens and a sigma 10-20 mm. I rarely use a tripod but if I know I need it I’ll take that as well. Just pay attention to light and think about the composition before snapping away. It’s these unplanned shots that are the best!